On July 30th 1918, during the battle of the Ourcq, Kilmer attached himself as adjutant to Major William Donovan who commanded the First Battalion. Donovan’s adjutant, Lieutenant Oliver Ames had been killed in combat the day before. The Regiment’s principle objective was the high ground of Muercy Farm. 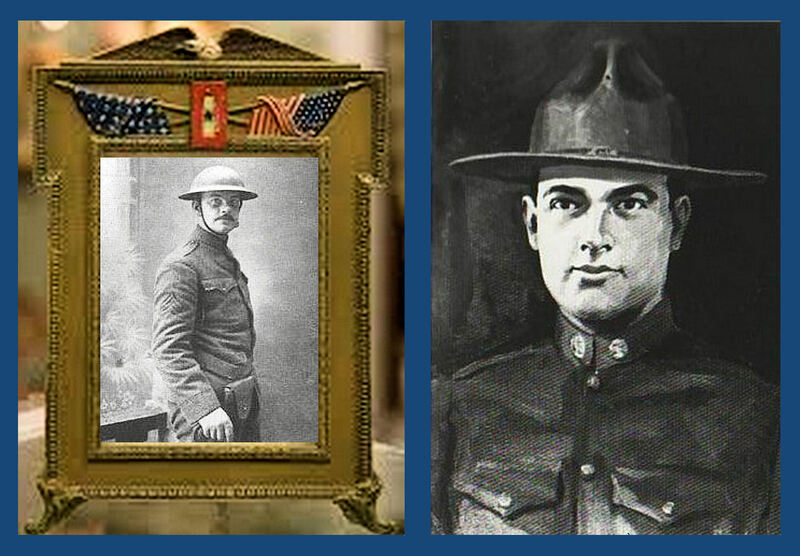 A sniper’s bullet ended the life of Joyce Kilmer at the age of 31. Ames and Kilmer were buried side by side in a creek bed on that farm just four months before the 11th month, the 11th day and the 11th hour of 1918 which marked the cessation of hostilities. That same date each year is now observed as Veterans Day. Today Sergeant Kilmer is interred in Aisne-Marne American Cemetery and WWI Memorial about 30 miles northeast of Paris. The 40 acre cemetery contains 6,012 headstones including 100 Stars of David, 241 MIAs, 597 unknown soldiers, and seven sets of brothers. Most had fought in the vicinity and in the Marne Valley during the summer of 1918. The headstones are lined up in four square burial plots with a pink granite memorial in the back is flanked by a Chapel and a Map Room. Joyce Kilmer was awarded the French Croix de Guerre for bravery. Camp Kilmer in New Jersey was named in his honor; it became the largest processing center for the U.S. Army and operated from 1942 until 2009. 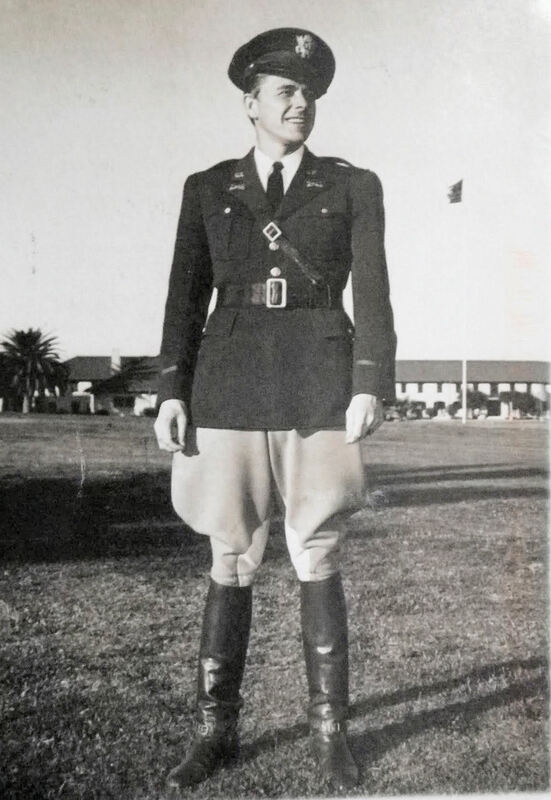 At the time of his entry into military service Kilmer was considered a premiere American poet. Much of his work expressed his deep religious beliefs. It is impossible to imagine the future contributions that might have been made by Joyce Kilmer and millions of other Americans lost forever beyond the seas. Please share some of his poetry with your children who are not likely to hear it otherwise. Yet covered with earth ten metres thick. Slumber well where the shell screamed and fell. You will not need them any more. Comrades true, born anew, peace to you! And your memory shine like the morning-star. Flames by His small and mighty camp. That is not gladdened by His face. The Splendour shining through Its veil. Silent, He calls me to His feet. He makes my spirit greatly free. The King of Glory enters in. And chat and watch the big stars pass. Of sheep and men of gentle will. On any honest thing again! And meanly serve its meanest inn. While sleep takes man and beast to her. The bitter punishment of wrong. The wrath of God is over me! Shall I be solaced in my pain. Upon my brow the mark of Cain. Will they not keep him for a night? So frail and pitiful and white. Is shut to you, come here instead. And piled fresh hay to make a bed. Here is some milk and oaten cake. The bounty of a child of care. I never saw a night so fair. How huge the sky is, and how deep! And how the planets flash and glare! What winged music I have heard! As if the sky were turning bird. O blinding Light, O blinding Light! Burn through my heart with sweetest pain. Consume away my deadly stain! And who are these that throng the way? And shining angels kneel and pray. I must and yet I dare not see. Lord, God, be merciful to me! Of new-washed sheep on April sod! O Lamb of God, O Lamb of God! Would make a home for me. And vex me with a song. About his kind old eyes. And listen to what you say. Who have come to seventy year. Red wine and golden beer. And silence rich and sweet. And the songs that must be sung. And that God’s on His throne in the sky. And he lets the world spin by. IS OBAMA A LOYAL AMERICAN? Before I became a fighter pilot and was trusted to command a multinational Provisional Wing, I trained as an Intelligence Analyst. I am sometimes disappointed because people don’t see what I see until I realize that very few are able to analyze diverse information to reach a conclusion. That ability and my experience in the field and at a major national security organization gives me an advantage. I am sharing my analysis of the data available to anyone who will spend time to look. Don’t take my word, do your due diligence and please keep aware and awake. Without Obama, our military could still defeat ISIS even after the Democrats gutted our Defense Department and Obama fired our best Generals. The U.S. Armed forces are weaker and smaller than they have been since before WWII. I am convinced all this is part of Barack Obama’s grand plan as he seemingly prefers ISIS over Americans. Maybe I can help you see this? After six years in office, American Citizens still know less about Barack Obama than any other President in History. It is a sad state of affairs that most citizens don’t even know what they don’t know. Barack Obama was endorsed by the Communist Party; do you know of any other President receiving such an endorsement? Wikipedia published an exhaustive list of Obama endorsements for 2012 but somehow skipped over the Communist Party. I demanded that the far left leaning Wikipedia remove the “Gene McVay” entry because it was vandalized and distorted. Anybody can edit the ever-changing website but there are super editors who make sure that THEIR agenda remains prominent. Maybe that’s why no reputable university or high school will allow students to use Wikipedia as a reference. Do you know of any other President who had his college records sealed? Then there is the Religion controversy. Apparently Barack and his family have been searching for a Christian Church to attend in D.C. for six years now. Each time the president has stepped into an African American church in the District, about six times, his visit has been preceded by stern warnings from pastors to their flocks to be courteous and respectful in the hopes of wooing the first family. But pastors and members of the churches he has attended have resigned themselves to the fact that Obama might visit but most likely won’t join. To my knowledge Obama’s spiritual upbringing was Muslim and his adult life in Chicago was spent listening to Reverend Jeremiah Wright’s fiery sermons that were incessantly played by media during the 2008 campaign. You may recall his quotes about God damning America and his accusation that the U.S. government used HIV “as a means of genocide against people of color.” But the majority of Americans likely don’t know much about Wright’s personal background either. Some might contend that there’s no need to study Wright further; that the intense and seemingly anti-American rhetoric that was observed on television sets across America tells us all we need to know about one of the nation’s most controversial pastors. However, considering the elevated level of influence Wright had in President Barack Obama’s life, understanding the figure helps to shed further light on the president’s personal beliefs and ideals. The goals of Black Liberation Theology are to destroy white society, America and the so-called white church (traditional Christianity). Black Liberation Theology is, of course, the doctrine of Obama’s “church” in Chicago, as was declared by Reverend Jeremiah Wright. The Reverend James Cone who was born in Fordyce, Arkansas in 1938, is the founder of Black Liberation Theology. Black Liberation Theology is a branch of the black theology of Black Nationalism, which is a 100-year-old mass movement of several different religious sects, based on black identity, that variously present themselves as Jewish, Christian and Muslim, though they are not orthodox in any of these religions. Black Liberation Theology was derived in large part from the theology of the Nation of Islam in the 1960’s, now headed by Louis Farrakhan. The Nation of Islam is not orthodox Islam, but a cult-like, black sect. Black Liberation Theology is designed to be more sophisticated than the theology of the Nation of Islam, in order to better appeal to black urban professionals, and to infiltrate the hateful concepts of Black Nationalism more readily into the black churches and black community. Is a picture of our President starting to emerge? Can you name President Obama’s close friends beyond Valarie Jarrett, Al Sharpton, Eric Holder, a host of Hollywood celebrities and the liberal media? As President Obama travels around the world bowing to Muslims and criticizing the United States, our Military and our Police, he makes life much more difficult for our police, our military and our allies, especially Israel. Many veterans will be astonished by this figure from House Report 113-113 – DEPARTMENT OF DEFENSE APPROPRIATIONS BILL, 2014. The total number of U.S. Military active duty men and women at the end of FY 2014 (September 30, 2014) was 1,401,560. That number is smaller than the population of San Antonio, Texas. Our Marine Corps is down to 197,300 from 309,771 in 1969. Our Air Force is down to 329,460 from 905,000 in 1968. Our Navy is down to 322,700 from 691,126 in 1969. During WWII the Army strength was 8,266,373 including the Air Corps, the Navy had 3,319,586 military personnel and the Marines numbered 469,925 bringing the total active duty military strength to 12,055,884. The terrorist threat is not like the Axis Powers of WWII but in many ways, ISIS is a superior threat to our homeland. Although many of you think you are getting REAL news from the Liberal Alphabet channels, you are sadly mistaken. You are mostly getting recipes for gingerbread cookies and meaningless chitchat. There are a million distractions in your life to funnel your attention away from what is important. Jesus said, “Be careful, or your hearts will be weighed down with carousing, drunkenness and the anxieties of life, and that day will close on you suddenly like a trap. For it will come on all those who live on the face of the whole earth. Be always on the watch, and pray that you may be able to escape all that is about to happen, and that you may be able to stand before the Son of Man.” Are you too busy to watch and pray? For the first time in 2,000 years there is not a single Christian in Mosul. You might look up from your latte and ask, “Where is Mosul?” It’s just the second largest city in Iraq and the capital of the Nineveh Province in northern Iraq. Mosul exists on both sides of the Tigris River along with the ancient Assyrian city of Nineveh. The city is the historic center of the Church of the East. Christianity spread from Mosul as the church became the world’s largest Christian church in terms of geographical extent. The Church of the East had dioceses stretching from the Mediterranean to China and India. The tombs of several Old Testament prophets including Jonah are located in Mosul. THE TOMB OF JONAH, SACRED TO CHRISTIANS, JEWS AND MUSLIMS, BEFORE AND AFTER BEING DESTROYED BY ISIS. Today things have changed in Mosul, Christian husbands have been brutally murdered and their wives have been sold into slavery while their children have been beheaded and their heads displayed on spikes in city parks. This is not Apartheid, it is genocide. This is not hungry children; it is horrifically tortured and murdered innocent Christian Children. Is it still legal to say the word “Christian” in America or is it banned? ISIS has been busy killing while Obama has been busy golfing. Jordan is overrun with refugees fleeing the horror but Jordan will likely be overrun by ISIS too. If you think Hamas, the Muslim Brotherhood in Gaza according to their charter, is a problem, wait until they are joined by ISIS. One of Barack Obama’s first actions as President in 2009 was to release Abu Bakr al-Baghdadi from a U.S. detention camp. Today Abu is the leader of ISIS and the true heir to the throne of Osama bin Laden. Do you remember what Abu Bakr al-Baghdadi said when he was released? The ISIS leader said, “I’ll see you guys in New York.” Do you remember what Obama and Biden bragged over and over again? “Osama is dead and General Motors is alive.” Really? Of all the GM cars sold in the U.S., 70% are made overseas. Now that GM is run by the unions GM recognizes that they can’t compete as long as the actual cost of union labor is $70 an hour and GM is strapped with tons of regulations and taxes that overseas competitors don’t have. 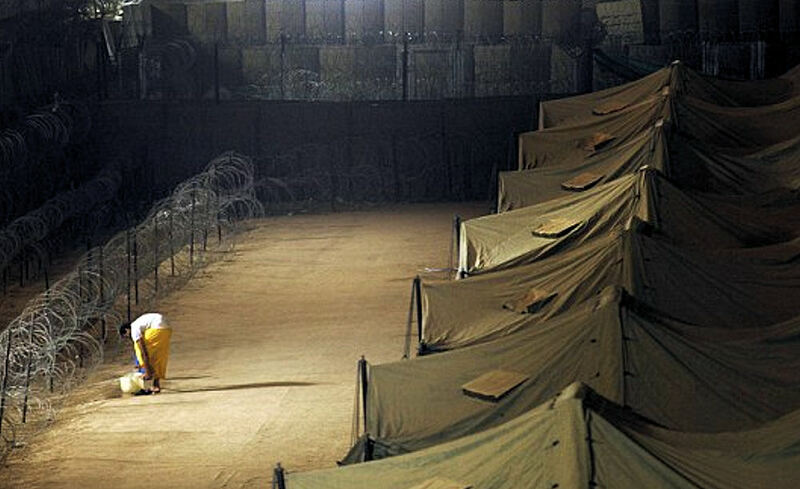 When Abu Bakr al-Baghdadi was in U.S. custody at Camp Bucca, he concealed his true nature. That chilling parting statement upon his release could become a battle cry for ISIS. There have been repeated threats about targeting various cities and bridges in America and how can we doubt these will come true? Americans are flocking to join ISIS and I fear that not all are headed to the Middle East. In addition, is it possible that members of ISIS and their sympathizers have been unable to locate the well worn path leading to and from the hole in the fence? At least 20 million illegal aliens found that hole. On the rare occasions when ISIS leader Abu Bakr al-Baghdadi is seen in public, his entourage is somewhere between that of a president and a mobster. Before al-Baghdadi appears in a Mosque, armed guards close the whole area. The women are sent upstairs to the women’s section to pray. Everyone is warned not to take photos or videos. It is a tense nerve-racking atmosphere. When Baghdadi finally shows up wearing black from head to toe, the guards start shouting, “Allah akbar! Allah akbar!” Then everybody is forced to swear allegiance to Baghdadi. Even after Baghdadi leaves, no one is allowed to leave the mosque for another 30 minutes. He has the working mentality of a Mafioso and expects his soldiers to be highly disciplined. He is known to be very organized and a proficient war planner. Acquaintances of the mastermind behind ISIS, who now controls a self-proclaimed caliphate in parts of Iraq and Syria, say he grew up studious, pious and calm. He was introverted, without many friends and was always known for being so quiet you could hardly hear his voice. Al-Baghdadi’s family was not wealthy, but two of his uncles worked for Saddam Hussein’s security forces. This meant they would have had some status and connections which would have inspired a certain reverence or fear in the community. Following his release from Camp Bucca, Baghdadi resumed his militant activities. While in prison an umbrella group of terrorist factions, including Al-Qaeda, had formed the Islamic State in Iraq, which al-Baghdadi joined. He was appointed the organization’s leader in May 2010. From the beginning, the Islamic State in Iraq had vast ambitions and a different agenda from Al-Qaeda even causing it to dump the Al-Qaeda flag. Al-Monitor dates the split from the group’s gradual disengagement from Al-Qaeda leaders in Afghanistan and its search for separate funding sources. “Then, in mid-2013, Abu Bakr al-Baghdadi announced the establishment of the Islamic State of Iraq and al-Sham now commonly known as ISIS and rebelled against the orders of Ayman al-Zawahri, the leader of the international Al-Qaeda organization. Al-Zawahri wanted ISIS to be only active in Iraq and have Jabhat al-Nusra be Al-Qaeda’s representative in Syria.” Al-Monitor, the pulse of the Middle East, would not be a good source for Americans to read to learn about interesting recipes and watch viral videos of siblings rubbing whipped cream on each other’s faces. Here is a recent Al-Monitor headline: “Islamic State Reaps Profits from Organ Trafficking.” I’m thinking there is too much going on in America for Wolf Blitzer, Scott Pelley, Anderson Cooper, Brian Williams, Diane Sawyer, Ann Curry, Rachel Maddow, Andrea Mitchell or Chris Matthews to notice what is taking place in the world? One ISIS defector said he was with Baghdadi at the tense time of the break with al-Nusra, the Al-Qaeda affiliate working inside Syria. He recalls the paranoia and mistrust in those meetings, held somewhere in the nebulous border area of Syria and Turkey. Baghdadi met with men in a separate room in a trailer near the Turkish border and would only introduce himself to top-level commanders. The minor ones, he did not introduce himself to. 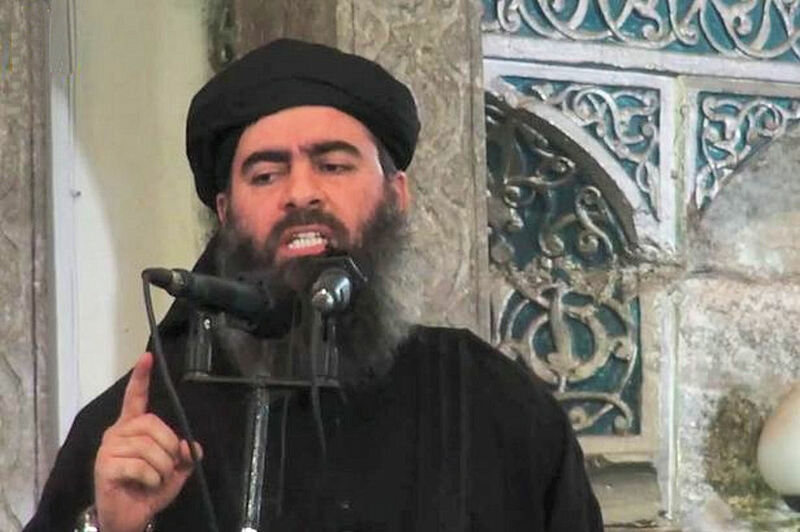 No one was sure which person in the room was really Baghdadi, he liked to keep people confused and off balance. Contrast that with President Obama who publicly announces firm dates for troop withdrawals. The administration does not bat an eye as they reveal their much-cherished secrets to make their man look good, heroic, decisive and strong. The leak that displayed all these attributes was the one that said the president personally approves the assassinations of terrorists abroad. He gives his okay, and the bad guys (some U.S. citizens) are dispatched via missiles from drones. At the same time, the Democrats gnash their teeth over waterbording terrorists at Gitmo, an advanced interrogation technique likely even demonstrated on our own troops during survival training. All administrations leak what they want when they want. Occasionally, some patriot screams something about national security and the Constitution, but the republic somehow survives and the secret is usually only a secret to the American people, not to the enemy. This was undoubtedly the case when it was disclosed that a computer worm was released to wreak havoc with the Iranian nuclear program. The Iranians were not playing golf and were on to it quickly. As ISIS gains more credibility and support, President Obama keeps reiterating that, “We will not be sending U.S. troops back into combat in Iraq.” Can you imagine Dwight Eisenhower giving comfort to the enemy by disclosing strategic information as important as whether or not the U.S. would employ ground troops? During WWII the U.S. even had phantom Divisions to fool the enemy. At one point the U.S. tried to make the Germans think General Patton was leading a large Division that did not exist. Are the token Generals loyal to Obama the only Generals left in command? The Keystone Kops could do a better job of defending America! The top priority of the Obama Administration is not defending America, it is taking legal guns away from law abiding citizens and granting amnesty to untold millions of illegal aliens from as far away as Yemen, Somalia and North Korea. He also seems intent on bankrupting our country and destroying our healthcare system. Thank you for stopping by, I covet your comments. Just after midnight on September 19, 1964, the tranquility of the sleepy delta town of Walnut Ridge was disturbed by the sound of an airliner approaching the old WWII runways of the town’s airport. Although the long runways could accommodate airliners, this was a very unusual occurrence. Three local teens decided to drive out to the airport to see what was going on. 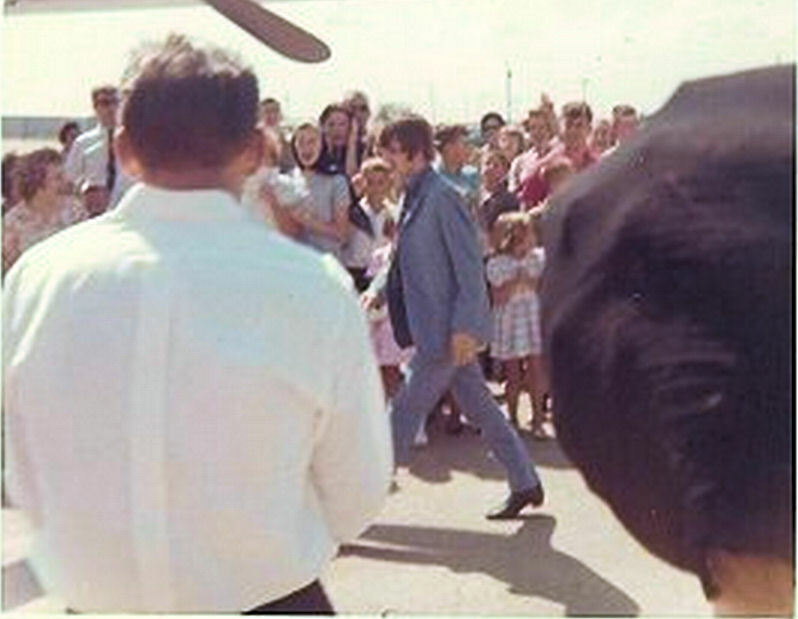 They watched in amazement as John Lennon, Paul McCartney, George Harrison and Ringo Starr stepped off the plane. 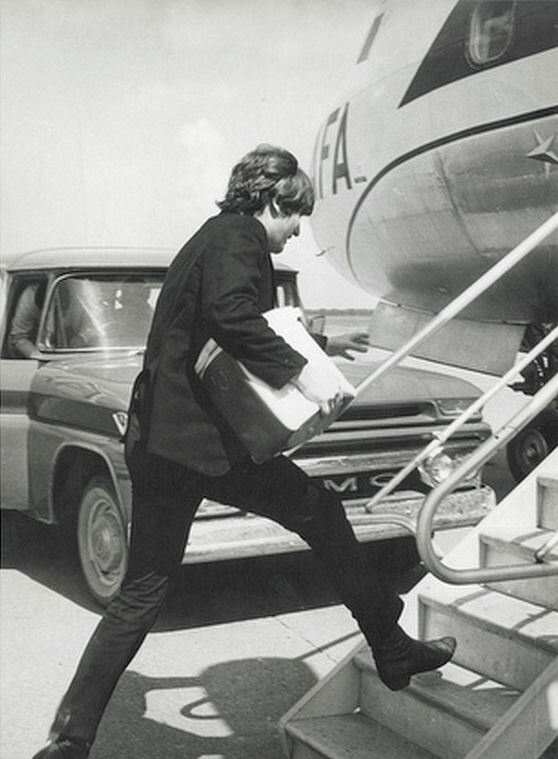 The Beatles, the biggest rock band in the world, had arrived at Walnut Ridge, Arkansas. 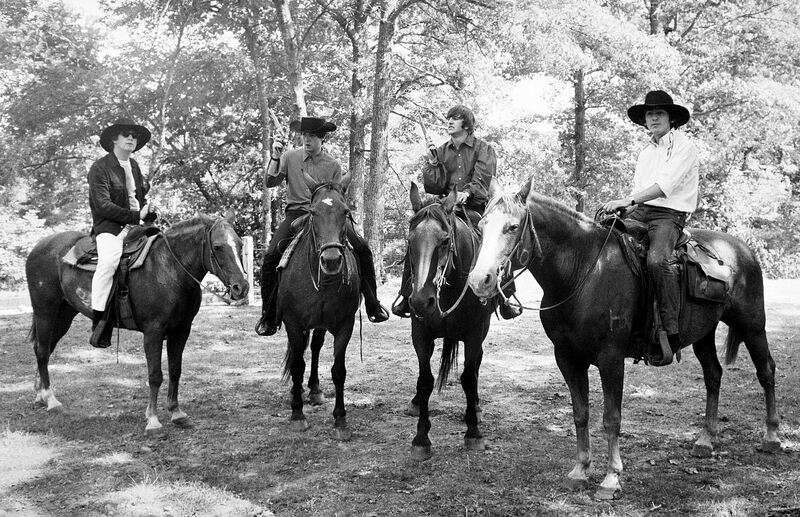 After performing in Dallas on that Friday evening, the Beatles were headed to a weekend vacation at a dude ranch in nearby Missouri. The ranch was owned by Reed Pigman, Sr., who operated the charter airline that flew the Beatles around the country. Walnut Ridge had the closest airport that could accommodate such a large plane, so the secret plans called for landing at Walnut Ridge and departing the following Sunday, but the secret didn’t last. Word spread quickly around the town, especially among teens who were inflicted with Beatle-mania. 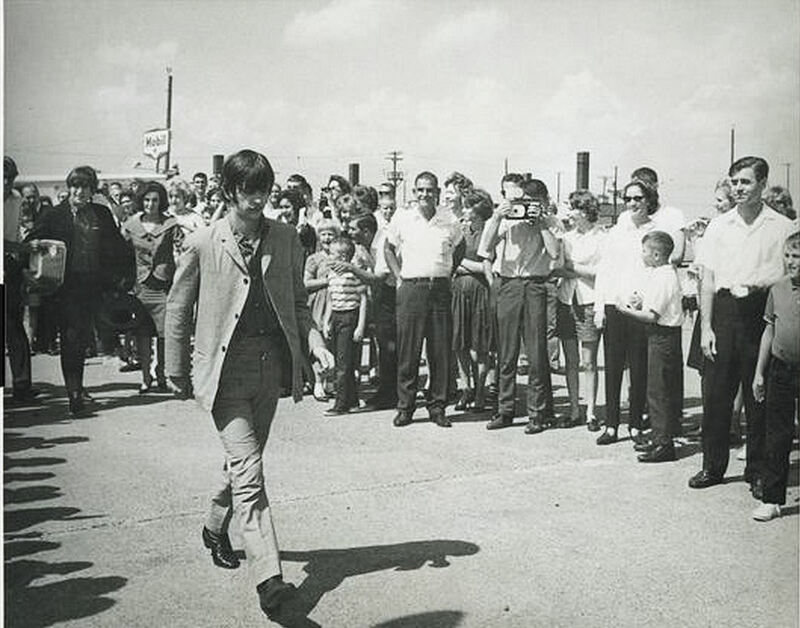 A crowd of several hundred was gathered at the airport by Sunday morning, September 20th, to greet the Beatles. Sure enough, they arrived, John and Ringo in a small plane and Paul and George in a GMC Suburban from Pigman Ranch. There were a few hands shaken and autographs given as the Fab Four walked through the Walnut Ridge crowd, and then the Beatles settled into their seats for the flight to New York City, where they would conclude their first American tour. WALNUT RIDGE, Ark.—It was more than a day in the life for folks in this sleepy southern farm town. Forty-seven years ago, at the height of Beatlemania, three teenagers here in the Lawrence County seat in northeast Arkansas ventured out one quiet Friday night to investigate reports that a large plane was mysteriously buzzing over a dusty World War II-era airstrip. They came back with a fantastic story: It was the Beatles. They’d just hung out. Now, Walnut Ridge is trying to cash in on the biggest thing ever to hit the town of 4,925—a fleeting stopover by the lads from Liverpool that connects it, however tenuously, to musical history. Few believed the teenagers’ story at the time, but the Fab Four had a respite between concerts and were sneaking to a dude ranch in nearby Missouri owned by Reed Pigman Sr., the businessman whose charter airline was whisking them from show to show. For a few minutes, they stood on the tarmac and chatted with locals before heading off to play cowboys. On the event’s 47th anniversary Sunday, Walnut Ridge unveiled a metal sculpture of the Beatles, modeled on the famed “Abbey Road” album cover (John, Ringo, Paul and George strolling in a crosswalk), and hosted a concert by the Liverpool Legends, Beatles impersonators managed by the sister of the late George Harrison. Paul McCartney and Ringo Starr, the group’s two surviving members, were invited, though no one really expected them to show up. 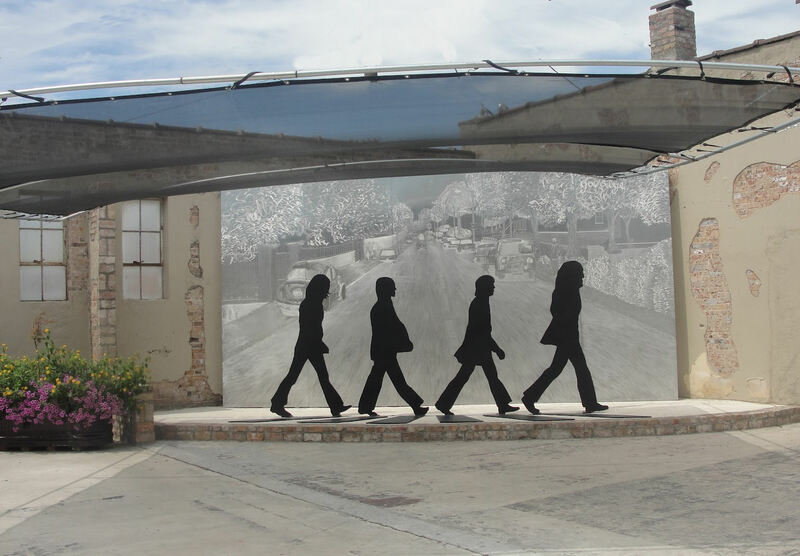 It’s part of a budding campaign by Walnut Ridge to capitalize on its smidgen-size brush with Beatles greatness and turn it into a tourist attraction. Walnut Ridge learned the local teens weren’t fibbing hours after their fateful run-in with the Beatles back in 1964, when a pilot staying at a motel leaked to townsfolk that he’d indeed flown the band—and that they were coming back to depart. Word got around. By the time the Beatles returned to Arkansas to fly to a gig in New York that Sunday, several hundred excited youngsters were waiting, screaming and snapping photographs. The Beatles boarded the plane and got back to where they once belonged. That’s the end of the story. Or at least it would have been, if anyone in Walnut Ridge had ever stopped talking about it. They never have. Aging women still get weepy retelling where they were when they heard the Beatles were coming to Walnut Ridge, what Easter dress they wore and what trinkets adorned their charm bracelets. Some still mourn the fact that they weren’t allowed to go because in this stretch of the Bible Belt, parents didn’t let kids miss church on Sunday just to catch a glimpse of some goofy looking Britons. A stretch of U.S. 67 officially named the “Rock ‘N’ Roll Highway” already runs through town, since Johnny Cash, an Arkansas native, and Elvis Presley played early gigs in the area. Pioneering Sun Records was about 90 miles away in Memphis, so boosters figure they can piggyback on the nostalgia tourism going on. They tracked down the red 1962 GMC Suburban two Beatles pulled up to the airport in the day the band departed, and had the impersonators roll out of it Sunday at the celebration. They’re trying to rename a local street Abbey Road. A documentary crew is shooting a movie. The Buildings for Babies Ranch Foundation plans to auction off the ranch’s furnishings as Beatles memorabilia, including the toilet: “Sit on the same throne as the Beatles!” a marketing brochure exclaims. Its chief executive, who says the group aids underprivileged children, expects the bathroom set to fetch $25,000. For Kathy Hall, who was 12 when the Beatles whirled through Walnut Ridge, the tourism drive is a nice way to help out a small town with a slowly dwindling population. But the Beatles visit will ultimately always be about the memories. Two years later, he died of a heart attack. Ms. Hall still has that album, stored in a vault. Even though I attended Southern Baptist College located at the airport that even used some former Walnut Ridge Army Air Force Base buildings, I never heard of the Beatles landing there. I started taking flying lessons in the area and received my Associates Degree there before being accepted for Air Force Pilot Training. My uncle, Louis Wilson, was a farmer and member of the school board and I knew hundreds of people there but not one mentioned the Beatles. The college is now Williams Baptist College. The stopover at Walnut Ridge was but a footnote in the history of the legendary band, but it was much more than that for the community that had a surprise encounter with the one and only Beatles. Lasting memories were made during that brief visit. The memory of seeing the Fab Four at the height of Beatlemania has endured. The 3rd annual Beatles at the Ridge festival occurred Sept. 19-20, featuring great live music both days, including performances by Riverbilly, Sonny Burgess and the Legendary Pacers, and Liverpool Legends, the Grammy-nominated tribute band hand-picked by George’s sister, Louise Harrison. Other activities included a talent contest, a British car show and shine, Beatles Karaoke for kids, a dog costume contest, duck calling contests, and much more. Maybe I will attend in 2015? I served in the Air Force during the miserable administration of Jimmy Carter. I was literally miserable because we had thermostat police who ensured military personnel were too hot in the summer and too cold in the winter. Carter only served one term but he was a busy man who brought expertise learned as a Georgia peanut farmer to the halls of world power. During Carter’s term as President, he created two new cabinet-level departments: the Department of Energy and the Department of Education. He established a national energy policy that included conservation, price control, and new technology. In foreign affairs, Carter gave away the Panama Canal and worked on limiting our nuclear weapons. On the economic front he confronted persistent “stagflation”, a combination of high inflation, high unemployment and slow growth. The end of his presidential tenure was marked by the 1979–1981 Iran hostage crisis, the 1979 energy crisis, the Three Mile Island nuclear accident, and the Soviet invasion of Afghanistan. In response to the Soviet move he ended détente, escalated the Cold War, and led the international boycott of the 1980 Summer Olympics in Moscow. The first time the US failed to participate in the Olympics since the modern Olympics were founded in 1896. By 1980, The Soviet Union retaliated by boycotting the 1984 Summer Olympics in Los Angeles. It did not withdraw troops from Afghanistan until 1989 some eight years after Carter left office. Carter’s popularity had eroded. Running for re-election that year, he defeated Ted Kennedy in the primary challenge for the Democratic Party nomination, but lost the general election to Republican candidate Ronald Reagan. Reagan was elected and reelected Governor of California and chose not to seek a third term. In 1976, Reagan challenged President Gerald Ford for the Republican Nomination for President. Ford narrowly won the primary and lost the General Election to Carter. In 1980 Reagan challenged another incumbent for President. The presidential campaign between Reagan and President Jimmy Carter was conducted during domestic concerns and the ongoing Iran hostage crisis. His campaign stressed some of his fundamental principles: lower taxes to stimulate the economy, less government interference in people’s lives, states’ rights, a strong national defense, pretty much the opposite of what we are seeing from the White House today. Reagan launched his campaign by declaring “I believe in states’ rights.” After receiving the Republican nomination, Reagan selected one of his primary opponents, George H.W. Bush, to be his running mate. His showing in the October televised debate boosted his campaign. Reagan won the election, carrying 44 states with 489 electoral votes to 49 electoral votes for Carter. Reagan received 50.7% of the popular vote while Carter took 41%, and Independent John B. Anderson, a liberal Republican, received 6.7%. Republicans captured the Senate for the first time since 1952, and gained 34 House seats, but the Democrats retained a majority. In 1981, Reagan became the first president to propose a constitutional amendment on school prayer. School prayer had previously been banned by the Supreme Court in 1962, and Reagan’s election reflected an opposition to the court’s decision. Reagan’s 1981 proposed amendment stated: “Nothing in this Constitution shall be construed to prohibit individual or group prayer in public schools or other public institutions. No person shall be required by the United States or by any state to participate in prayer.” In a message to Congress, Reagan said that his proposed amendment would “restore the simple freedom of our citizens to offer prayer in public schools and institutions.” In a nationally televised speech the following day, Rabbi Menachem M. Schneerson lauded Reagan’s speech and said the moment of silence would “ensure that children grow up to be decent and upright.” In 1984, Reagan again raised the issue, asking Congress “why can’t freedom to acknowledge God be enjoyed again by children in every schoolroom across this land?” In 1985, Reagan expressed his disappointment that the Supreme Court ruling still bans a moment of silence for public-school students, and said he had “an uphill battle.” In 1987 Reagan again renewed his call for Congress to support voluntary prayer in schools and end “the expulsion of God from America’s classrooms.” During his term in office, Reagan campaigned vigorously to restore prayer to the schools, first as a moment of prayer and later as a Moment of Silence. Today, we are seeing the result and paying the price for kicking God out of public schools. While critics tend to rely on the three-decade long decline of the Scholastic Aptitude Test (SAT) to document the dumbing down of American education, more alarming is U.S. performance against the students of other industrialized countries. By virtually every measure of achievement, American students lag far behind their counterparts in both Asia and Europe, especially in math and science. Moreover, the evidence suggests that they are falling farther and farther behind. The U.S. is among the countries expending the highest proportion of their gross national product on education but U.S. elementary school and secondary school students never place above the median in comparative studies of academic achievement. Today the U.S. ranks 25th – 28th in Math under liberalism and without God. In summer 1981 PATCO, the union of federal air traffic controllers went on strike, violating a federal law prohibiting government unions from striking. Declaring the situation an emergency as described in the 1947 Taft–Hartley Act, Reagan stated that if the air traffic controllers “do not report for work within 48 hours, they have forfeited their jobs and will be terminated”. They did not return and on August 5, Reagan fired 11,345 striking air traffic controllers who had ignored his order, and used supervisors and military controllers to handle the nation’s commercial air traffic until new controllers could be hired and trained. A leading reference work on public administration concluded, “The firing of PATCO employees not only demonstrated a clear resolve by the president to take control of the bureaucracy, but it also sent a clear message to the private sector that unions no longer needed to be feared”. During Jimmy Carter’s last year in office, inflation averaged 12.5%, compared with 4.4% during Reagan’s last year in office. During Reagan’s administration, the unemployment rate declined from 7.5% to 5.4%, with the rate reaching highs of 10.8% in 1982 and 10.4% in 1983, averaging 7.5% over the eight years. I hear the talking heads tell us that the Obama recovery after Bush is greater than the Reagan recovery after Carter. Sorta like “if you like your plan you can keep your plan, period.” Reagan’s economy was so strong that, for the last three-quarters of his administration, Americans were flooding into the workforce. Under Obama, the opposite has happened, and those who have given up on working aren’t counted as unemployed. Even today labor-force participation remains at its lowest level since 1978. Don’t blame waves of retirement for that fact: the Census Bureau reported that, from 2005 to 2010, older Americans actually became more likely to be employed. The percentage of 65-69 year-olds remaining in the workforce jumped from 26 percent to 32 percent over a ten-year-period ending in 2012. Among those 70-74 the jump was even more startling: from 14 percent to 19.5 percent. Meanwhile workers in the prime of their lives have simply left the playing field. How about overall growth? GDP under Reagan was turbocharged compared to the Obama years. 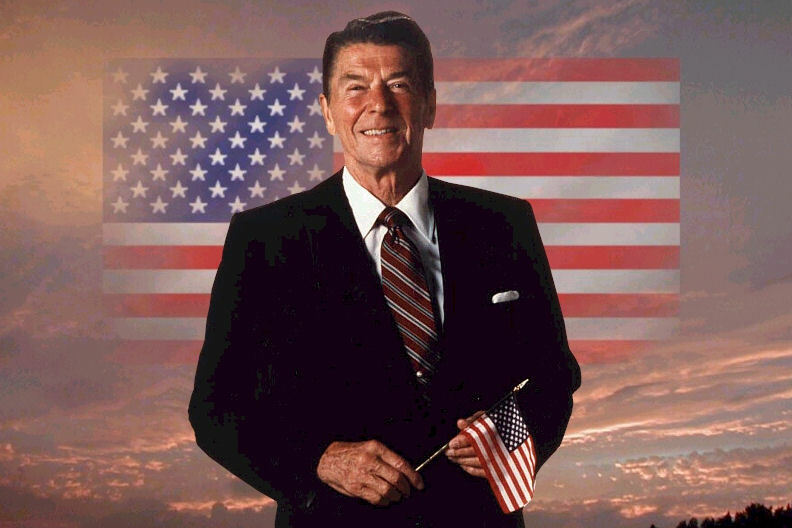 The Reagan years brought annual real GDP growth of 3.5 percent – 4.9 percent after the recession. In inflation-adjusted 2009 dollars, GDP jumped from 6.5 trillion at the end of 1980 to 8.61 trillion at the end of 1988. That’s a 32 percent bump. As Peter Ferrara pointed out on Forbes, it was the equivalent of adding the West German economy to the U.S. one. Under Obama, GDP up to June 30, 2014 has grown an anemic 9.6 percent, total. Reagan-era growth was far more than double the Obama rate. How did that so-called Reagan trickle down economy work for ordinary Americans? Real inflation-adjusted median household income shot up some ten percent during the Reagan years. It has flat lined or declined by $4,000 under Obama. Sixteen million new jobs were created, while inflation significantly decreased. The net effect of all Reagan-era tax bills was a 1% decrease in government revenues when compared to Treasury Department revenue estimates from the Administration’s first post-enactment January budgets. However, federal income tax receipts increased from 1980 to 1989, rising from $308.7 billion to $549 billion reflecting the dramatic growth in the economy. Reagan escalated the Cold War, accelerating a reversal from the policy of détente which began in 1979 following the Soviet war in Afghanistan. Reagan ordered a massive buildup of the United States Armed Forces and implemented new policies towards the Soviet Union: reviving the B-1 Lancer program that had been canceled by the Carter administration, and producing the MX missile. In response to Soviet deployment of the SS-20, Reagan oversaw NATO’s deployment of the Pershing missile in West Germany. Reagan was the first American president ever to address the British Parliament. Together with the United Kingdom’s Prime Minister Margaret Thatcher, Reagan denounced the Soviet Union in ideological terms saying, “the forward march of freedom and democracy will leave Marxism–Leninism on the ash heap of history”. On March 3, 1983, he predicted that communism would collapse, stating, “Communism is another sad, bizarre chapter in human history whose last pages even now are being written”. In a speech to the National Association of Evangelicals on March 8, 1983, Reagan called the Soviet Union “an evil empire”. After Soviet fighters downed Korean Air Lines Flight 007 near Moneron Island on September 1, 1983, carrying 269 people, including Georgia congressman Larry McDonald, Reagan labeled the act a “massacre” and declared that the Soviets had turned “against the world and the moral precepts which guide human relations among people everywhere”. The Reagan administration responded to the incident by suspending all Soviet passenger air service to the United States and dropped several agreements being negotiated with the Soviets, wounding them financially. As result of the shoot down, and the cause of KAL 007’s going astray thought to be inadequacies related to its navigational system, Reagan announced on September 16, 1983, that the Global Positioning System would be made available for civilian use, free of charge, once completed in order to avert similar navigational errors in future. Under a policy that came to be known as the Reagan Doctrine, Reagan and his administration also provided overt and covert aid to anti-communist resistance movements in an effort to “rollback” Soviet-backed communist governments in Africa, Asia, and Latin America. Reagan deployed the CIA’s Special Activities Division to Afghanistan and Pakistan. They were instrumental in training, equipping and leading Mujaheddin forces against the Soviet Army. President Reagan’s Covert Action program has been given credit for assisting in ending the Soviet occupation of Afghanistan. In March 1983, Reagan introduced the Strategic Defense Initiative, a defense project that would have used ground- and space-based systems to protect the United States from attack by strategic nuclear ballistic missiles. The Soviets became concerned about the possible effects SDI would have; leader Yuri Andropov said it would put “the entire world in jeopardy”. For those reasons, David Gergen, former aide to President Reagan, believes that in retrospect, SDI hastened the end of the Cold War. In the 1984 presidential election, Reagan won every state except for Washington, D.C., and his opponent’s home state of Minnesota. Today the liberal arm of the Republican Party keeps screaming that Conservatives cannot get elected. Senior GOP leaders have all but declared war against Conservatives. Reagan accepted the Republican nomination in Dallas, Texas. He proclaimed that it was “morning again in America”, regarding the recovering economy and the dominating performance by the U.S. athletes at the 1984 Summer Olympics, among other things. He became the first American president to open an Olympic Games held in the United States. Until the early 1980s, the United States had relied on the qualitative superiority of its weapons to essentially frighten the Soviets, but the gap had been narrowed. Saudi Arabia increased oil production, which resulted in a drop of oil prices in 1985 to one-third of the previous level; oil was the main source of Soviet export revenues. These factors contributed to a stagnant Soviet economy during Gorbachev’s tenure. Mikhail Gorbachev was the eighth and last leader of the Soviet Union. 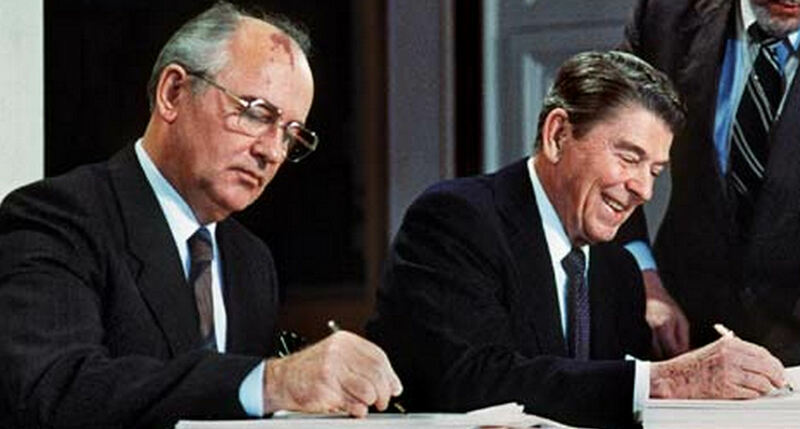 Reagan recognized the change in the direction of the Soviet leadership with Mikhail Gorbachev, and shifted to diplomacy, with a view to encourage the Soviet leader to pursue substantial arms agreements. Reagan believed that if he could persuade the Soviets to allow for more democracy and free speech, this would lead to reform and the end of Communism. The two leaders laid the framework for the Strategic Arms Reduction Treaty, or START I; Reagan insisted that the name of the treaty be changed from Strategic Arms Limitation Talks to Strategic Arms Reduction Talks. When Reagan visited Moscow for a summit in 1988, he was viewed as a celebrity by the Soviets. A journalist asked the president if he still considered the Soviet Union the evil empire. “No”, he replied, “I was talking about another time, another era”. At Gorbachev’s request, Reagan gave a speech on free markets at the Moscow State University. In his autobiography, An American Life, Reagan expressed his optimism about the new direction that they charted and his warm feelings for Gorbachev. In November 1989, ten months after Reagan left office, the Berlin Wall was torn down, the Cold War was officially declared over at the Malta Summit on December 3, 1989, and two years later, the Soviet Union collapsed. 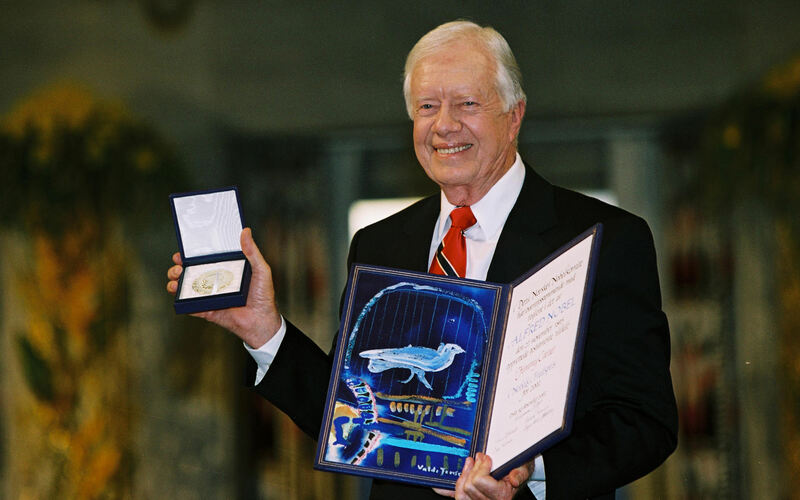 Both Jimmy Carter and Mikhail Gorbachev were awarded Nobel peace prizes. Gorbachev was also honored with the Otto Hahn Peace Medal, the Harvey Prize and several honorary doctorates from various universities. Sorta makes your stomach churn does it not? No, Ronald Reagan was never awarded the Nobel peace prize but many said he won it. They just gave it to Gorbachev instead. I think it is telling when you see who were tossed the prize versus those who were snubbed. Mahatma Gandhi, had several nominations and one of the strongest resumes in any peace movement but Gandhi failed to win the peace prize. Corazon Aquino was the first female president of the Philippines; Aquino was a symbol of democracy for the Asian world. She lost her Nobel bid to Elie Wiesel. Rigoberta Menchu Tum, the Guatemalan activist who fabricated her autobiography and supported murderous Communist guerrillas and tablecloth wearing Yasser Arafat were shoo-ins. Joining Carter and Gorby are Mohammed El Baradei, the International Atomic Energy Agency chairman who consistently underplayed Iranian nuclear ambitions, Al Gore and the Intergovernmental Panel on Climate Change, and Barack Obama, in the very first year of his presidency. Recognition of genuine achievement has been replaced by the worst kind of genuflection toward liberal icons. I hope they enjoy their 15 minutes of fame. “We will never forget them, nor the last time we saw them — this morning, as they prepared for their journey, and waved good-bye, and ‘slipped the surly bonds of earth’ to ‘touch the face of God. '” (Speech about the Challenger disaster). “I’ve spoken of the shining city all my political life, but I don’t know if I ever quite communicated what I saw when I said it. But in my mind it was a tall proud city built on rocks stronger than oceans, wind-swept, God-blessed, and teeming with people of all kinds living in harmony and peace, a city with free ports that hummed with commerce and creativity, and if there had to be city walls, the walls had doors and the doors were open to anyone with the will and the heart to get here. That’s how I saw it and see it still. WHO CARES ABOUT AMERICAN YOUTH? 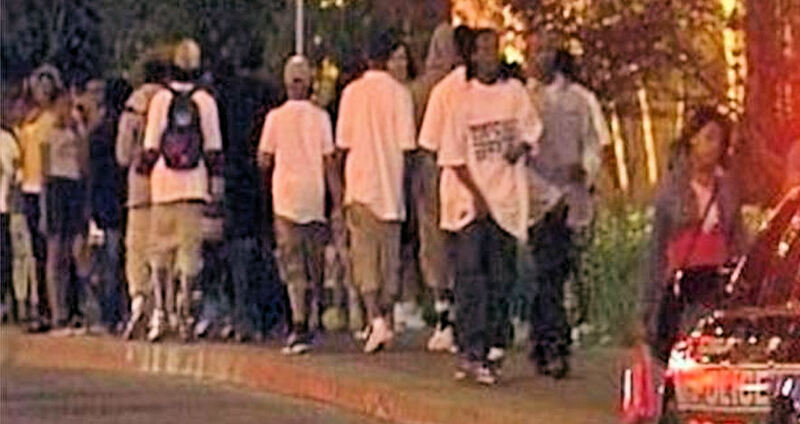 While President Obama and his High Level Choom Gang jet around the country condemning police and granting amnesty to illegal aliens, many of our youth, mostly minority black and Latino, have no prospects for employment. Their leisure activities and life satisfaction cannot be characterized as fulfilling or rewarding. The situation is much worse in inner cities. In the President’s home state of Illinois the teen employment rate is only 27%, a decrease of 10 percentage points from 2006, according to a report by the Chicago-based Alternative Schools Network. Illinois is among the worst states for teens but the picture is not that much different across the country. I believe it is better for teens to have a jobs than it is for a teens to just hang out and be exposed to seedy activities. The teen employment rate at the national level is the lowest in post-World War II history, and getting worse. In Chicago 81% of teens are unemployed. Across all geographic areas, black teens have the lowest employment rates compared to all other racial and ethnic groups. In Illinois, only 16% of black teens are employed while just 11% of black teens in Chicago have jobs. The exclusion of teens from the job market is likely to continue and brings with it bleak economic prospects, limited earnings potential and significant taxpayer burden for the magnitude of jobless youth. Job creation for teens and young adults is never mentioned by politicians who lavish schools with more money than they can spend and entice more and more illegal aliens to cross our borders through the hole in the fence. Some low-wage jobs, which are typically associated with young people, are being created, but due to the overall shortage of jobs in recent years, older people with higher levels of education are beating teens out for these low-wage positions. Black male teens ages 16 to 19 in Chicago face the most depressed state of employment. The employment rate among Chicago’s black male teens dropped from 10% in 2006 to 8% now. For those of you who study Common Core Math, that means 92% of Chicago’s black male teens are jobless. Prospects for poor black teens living in low-income households are even worse with a 94% unemployment rate. Government at all levels has thrown money at the problem and worked their magic but things just get worse. The government that governs least governs best. Don’t hold your breath. The BIGGEST JOB KILLER IS THE MINIMUM WAGE! Recently voters in Arkansas voted to increase the state’s minimum wage. The increase was supported by both the Republican and Democratic candidates for governor. What if there had been a ballot initiative to give everybody in Arkansas one million dollars tax free? I can guarantee it would have passed. See how good it feels? We all lived happily ever after. The job creators in America are the small businesses. Many of these businesses are struggling with owners working up to 100 hours a week for much less than minimum wage. Owners have poured their life savings along with their hearts and souls into their businesses. Government punishes these businesses with high taxes, out of control regulations and higher and higher minimum wages. The dam can just hold so much water. There are approximately 5.68 million employer firms in the United States. Firms with fewer than 500 workers accounted for 99.7% of those businesses while businesses with less than 20 workers made up 89.8%. Small businesses continue to be incubators for innovation and employment growth and continue to play a vital role in the economy of the United States. They represent almost half of our private nonfarm GDP. The picture is also gloomy for 20 to 24 year-olds. They are twice as likely as teens to be both jobless and out of school. The incidence of disconnection from school and work is growing across America as college graduates cannot find work. Of those who find jobs, most are working in jobs that do not require a college degree. 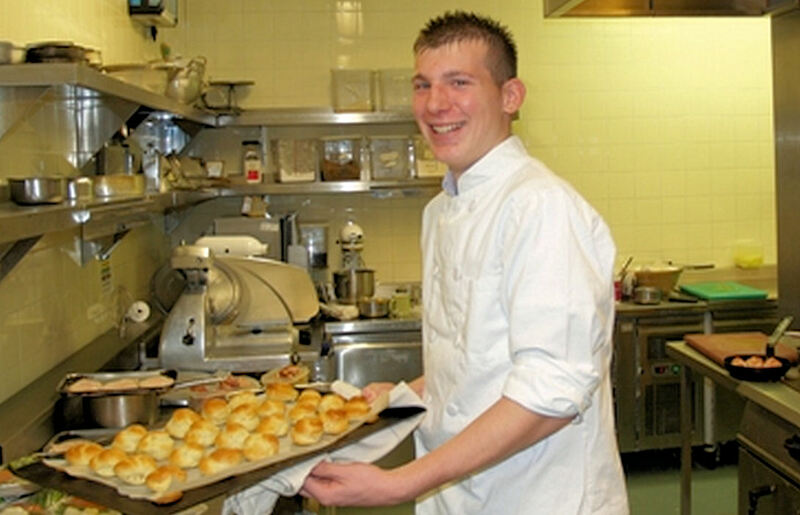 The loss of teen employment opportunities poses serious policy implications nationally and locally including significant adverse affects on future employability, earnings, family incomes, and marriage rates, as well as serious fiscal burdens on the rest of society associated with lower lifetime earnings, lessened tax contributions and higher correctional costs. Black students are more than three times as likely as their white counterparts to be expelled or suspended from school. And about 70% of students involved in school-related arrests or referrals to law enforcement are black and Latino. Discipline policies such as expulsions, suspensions and school-based arrests can increase the chances of students dropping out of school or failing to graduate on time. America is being turned upside down by the first black president and attorney general and their surrogates. I know this is puzzling so I will attempt to explain why. In the black community under our Barack Obama, Eric Holder and the Democrats, life is miserable with the high unemployment I mentioned and sub standard schools. These guys oppose school choice and keeping poor teachers on the job. The retiring general counsel for the Teacher’s Union said the union is not about the children, it is about POWER. With Teacher’s Unions and Government Unions both government and schools have gotten worse and worse, but that’s a different story. Black on black crime is through the roof. Nine out of ten blacks are murdered by blacks. 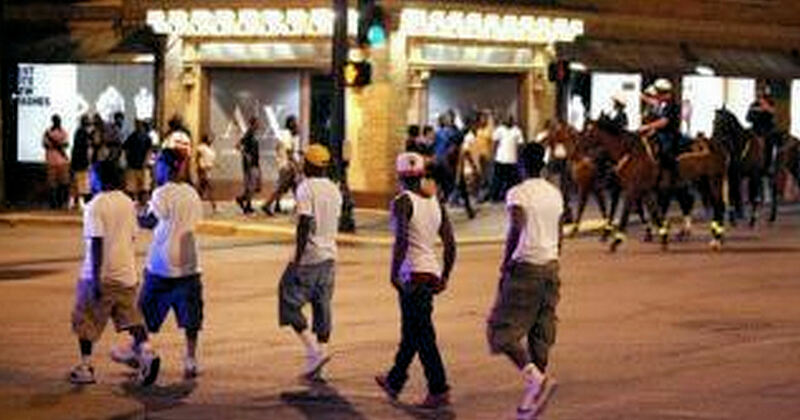 You have gang violence in inner cities like Chicago. What is Obama and Holder doing about it? Beyond stirring up citizens and inciting riots, NOTHING! Obama and Holder and their surrogates are undermining our police officers even black police officers. It appears they want to nationalize the police, what would it be, Obamapolice? Why are these liberals doing such a catastrophic job? This has nothing to do with racial profiling, nothing to do with racist cops, nothing to do with the militarization of the police force, and yet this is what they regurgitate. Liberals and conservatives can look at any problem and pose far different solutions. Amnesty and more illegal alien mouths to feed is NOT a solution for struggling American teens and businesses. Creating MORE make-work government jobs is NOT a solution. I worked as a ten year old boy and it didn’t kill me. I didn’t need a living wage, my family had a one room house and both my parents worked as did my older brother. I thank God that we never received a dime from the government. Government Welfare can be intoxicating and debilitating. I helped a neighbor haul hay and another by digging a ditch as a strapping teen. I caught chickens returning home just in time to clean up and go to school. Work didn’t destroy my education, I was a first string basketball player in both Junior and Senior Varsity and a leader in several organizations. I wrote a column for the school newspaper and also received an education. It must have been a good education because I was never a freshman in college. I tested out of every subject and started my work at the University of Maryland as a sophomore. I have been fortunate enough to speak to students from pre-school to college. I believe it is important for leaders to share advice with students. Dear government, LET MY PEOPLE WORK!!! Stop robbing from the poor to pay other poor. Get out of the way of progress. Is it better for a teen to have a job paying $5 an hour or for a teen to be broke and roaming the streets? The government WAR ON POVERTY DOES NOT WORK!!! Any WORK is dignified and gives a sense of self worth and pride along with a history of experience for the future. Our politicians seem preoccupied with the problems of everybody in the world except United States Citizens. Can we get some attention, HELLO? I want my taxes to help my country, please. You are currently browsing the Gene McVay On Guard blog archives for December, 2014.